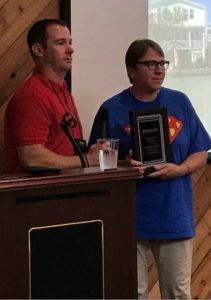 Brian Thomson receives the Mitigation Manager of the Year Award from Emory Kidd, 2017 Mitigation Manager of the Year. Falmouth, one of Kentucky’s top ten cities for flood insurance with policies totaling over $22 million, urgently needed help. 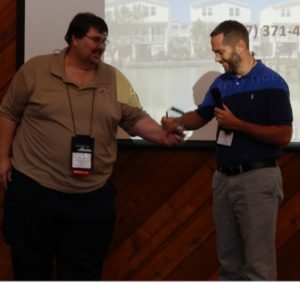 Brian brought together local officials, legislators, State and Federal Representatives, community stakeholders, and neighboring counties to tackle rising insurance rates and floodplain development issues. His initiative led to formation of a Local Floodplain Development Committee with a united goal of becoming a CRS community. Brian is the committee’s driving force. He rewrote Falmouth’s Flood Ordinance to the higher CRS regulatory standard, updated the County’s Comprehensive Plan to address floodplain development and guided local officials to institute sound mitigation practices. Through extensive outreach tools, he has significantly improved community awareness on flood-related issues. His diligence resulted in the coveted CRS designation this year for all his jurisdictions an unprecedented initial entry at Level 7 for Falmouth and Butler and Level 9 for the County. He saved residents over $41, 000 in insurance premiums. Esther White receives the Mitigation Project of the Year Award on behalf of the Great Saltpetre Preserve from Brian Bishop, 2017 Floodplain Manager of the Year. The Great Saltpetre Preserve (GSP) is the home of a historic limestone cave once mined for saltpeter that is now listed on the National Register of Historic Places. The 306-acre property is managed and maintained by a dedicated, nonprofit group of volunteers who are committed to preserving an important part of Kentucky’s natural beauty and history. Neena Jud, GSP Secretary, applied for mitigation grant funding to reduce repetitive damages to the grounds and roadway from runoff during heavy rainfall events. After the grant was awarded in 2017, she and her husband, Werner, rallied the volunteers and completed the drainage improvement project in less than six months. Incorporating elements of green infrastructure design including swales and native plantings, the group successfully installed culverts, drains, and rock dispersion structures to effectively control the runoff. The result is a solution that blends with the natural environment and highlights the beauty of collaboration with dedicated individuals.